MOLLUSCA : NUDIBRANCHIA : Cumanotidae SNAILS, SLUGS, ETC. Description: This is a beautiful and rare aeolid, with long flowing cerata. The body is translucent with speckles of gold pigment on the dorsum and concentrated into patches on the head. The cerata taper smoothly from broad bases to fine tips. They are translucent, with the brown digestive gland showing clearly in the basal region but becoming very thin distally. There are elongate cnidosacs in the tips of the cerata. Flecks of gold pigment decorate the upper surfaces of the cerata. The cerata are muscular and the animal is capable of swimming by vigorous flexing of the body. 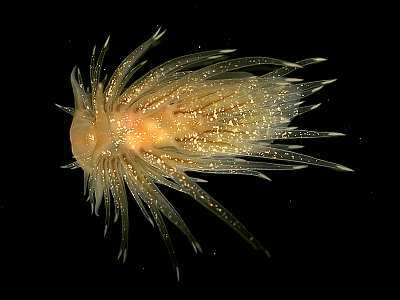 Habitat: This species feeds on the hydroid Corymorpha nutans, a large athecate hydroid which grows as single individuals on sand or gravel seabeds. Distribution: Records of this species are scarce, recently it has been found in Northern Ireland and western Scotland; the original locality was Plymouth and it was found at the same time in Norway. Transparent body with gold speckles of pigment . Picton, B.E. & Morrow, C.C. (2016). Cumanotus beaumonti (Eliot, 1906). [In] Encyclopedia of Marine Life of Britain and Ireland.